Not too long ago I had to replace the clutch on my track bike, as I had a track day rapidly approaching that weekend. Driving around to get the parts I needed, I turned to Siri on my iPhone for help in finding a nearby Yamaha dealer, as I knew that the clutch plates would need to be ordered that day (with only a couple hours left in the work day) and overnighted to me, if I was to get my R1 ready in time. A couple verbal commands later (along with a couple chuckles over how Siri pronounces “Yamaha”), and something funny happened. Siri decided to give me a little life advice on my two-wheeled inclinations, with a “now, you be careful on that thing” comment. The first time it happened caught me completely off-guard, and was good for a few minutes of chuckling. But then I got worried. Had I finally lost it? Did that really just happen? It took maybe a dozen more tries before I could get Siri to repeat herself, but the below screenshot is the fruits of that labor. I have yet to replicate the comment again, and it’s interesting that the same command produced a number of different Yamaha dealers near the A&R office. 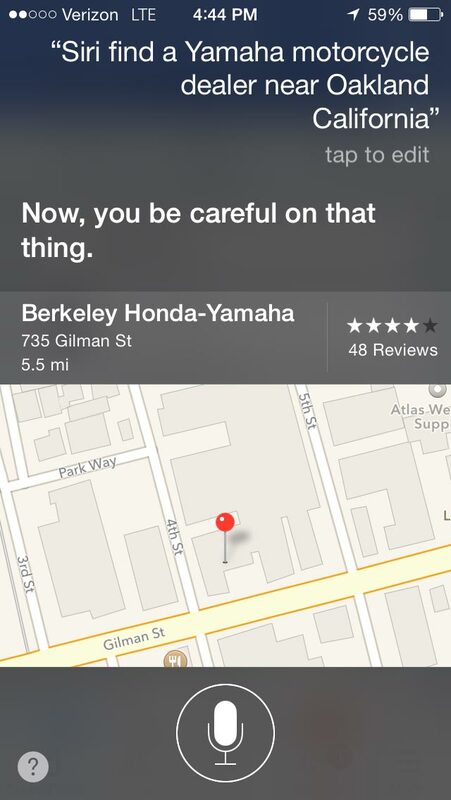 There are several long lists of interesting Siri comebacks, and it looks like motorcyclists have their own contribution to add now. Let us know in the comments if you’ve got a motherly Siri in your pocket as well.